Preparing athletes to accomplish their triathlon goals. Work with all levels but specialize in Half and Full Ironman distance athletes. Plans are not “cookie cutter”. I build schedules and monitor progress on a weekly basis. Plan will include specific sessions geared to athlete's experience and fitness levels. Rates vary based on requirements, but the most popular is $350 for the first month then $200/month. Includes regular interaction on the phone, email and in-person sessions. 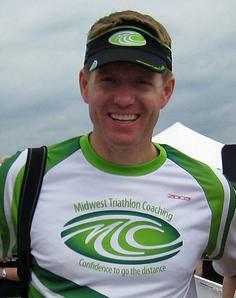 Been coaching triathletes for 10+ years including over 50 athletes to successful Ironman finishes since the 2007 season. Certified USAT Level I Coach. Have a busy work and family life in Kansas City; understand that athletes don’t have time to waste on unproductive training activities. Athletes need to have some type of GPS/HRM (such as Garmin 935). ~50% of my athletes have a powermeter but its not a "requirement". Success. Coach Ken Welsh has been notified of your message.